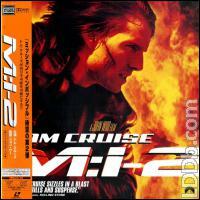 MISSION: IMPOSSIBLE 2,JAPANESE RELEASE APRIL 03 2001.WIDESCREEN.FACTORY SEALED,PLASTIC COVERING INTACT.OBI STRIP FADING NOTED ON FRONT FACE OF BAND.MINOR TOP/BOTTOM CORNER JAMS AT OPENING.MINOR CORNER CREASE.NO SEAM TEARS NOTED UNDER COVERING.EXCELLENT ! Clean, complete with OBI. Very good almost mint condition, a few hairlines, 1 hair-light scuff on left side of front cover visible only trough light-reflection. Discs intact, like new. Ask for photos. Cheap, tracked and insured DHL shipping from Germany.